I am a list maker, a note taker, and an occasional journal keeper. I have made notebooks for menu planning, things to do, budgets, ideas on various topics. However, I usually write all this information on the closest piece of paper available and can rarely find it when I need it. In my old(er) age I have found that my memory isn’t what it used to be and have missed more than one important task, meeting, or event. It’s time for an organizer! I began researching all the planner options a few weeks ago. Wow! Who knew there were so many available? 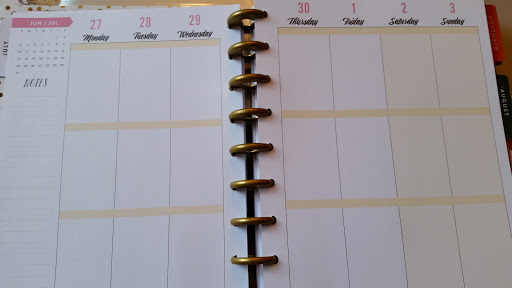 There are planners for teachers that would have been great when we were homeschooling, a memory planner that would be great for newlyweds or new parents, daily calendar planners, and everything in between. 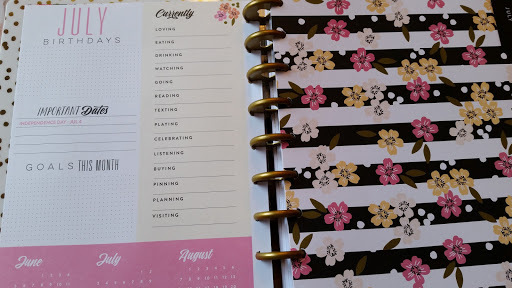 What I was looking for was a planner that I could track appointments, keep track of birthdays and anniversaries, jot down ideas, log menu plans, track the budget, things to do, goals, and I wanted it all in one planner. This has almost everything I was looking for and with a little imagination I can work the other things into it. I chose the Happy Planner. I searched online for a place to purchase it and was pleasantly surprised to see that Hobby Lobby carried them. The best part was that I had a 40% off coupon. Win, win! GO ME! Isn’t it cute? This planner contains 18 months rather than the typical 12 month planner. I love the area for goals and important dates each month. Because the daily planner is laid out in vertical form, it gives plenty of room for menu planning, appointments, and things to do on each day. It also has a month at a glance with a note section on the side. There are so many additional things you can purchase for this planner. You can get menu planners, budget forms, things to do forms, stickers. I plan to use colored markers to “brighten” things up.